This is the back story to the book Critique of Lean. Lean is a product. Products are designed. Designs have weaknesses. Critique of Lean examines weaknesses in the product and its design. In the nearly 30 years since the term “Lean” was introduced, we have a just handful of examples of (Real) Lean transformation. Unfortunately, there are many more examples of Fake Lean and Lean transformation process failures than there are successes – by a wide margin. What accounts for the huge gap between expected and actual outcomes? I have closely followed the evolution of Lean and its application in industry. As a long-time practitioner, contributor to the body of Lean knowledge, teacher, coach, and careful observer, I have watched people needlessly struggle because of widespread misinformation and misunderstanding about Lean in relation to its association with Toyota’s management practices. This association began in 1988 with the initial characterization of Lean as synonymous with the Toyota production system (TPS). Post-2008, Lean was characterized as synonymous with Toyota’s management system (TMS). But, was Lean ever actually synonymous with TPS? No. Is Lean synonymous with TMS? No. The differences between Lean and TPS and TMS are vast, and recognition of this has been dreadfully slow and remarkably incomplete by the people who gave us Lean: James P. Womack and Daniel T. Jones. The organizations that they founded and continue to lead, the Lean Enterprise Institute in the U.S. and Lean Enterprise Academy in the U.K., have dutifully carried forward the myths that Lean = TPS and Lean = TMS for 20 years. The result is that people have labored under illusions of sameness with TPS/TMS, only to discover that the results they achieve are far less than they anticipated. In addition, people have been harmed by Lean though layoffs and other types of unfavorable outcomes, due in part to mindsets, principles, and practices that are enshrined in TPS/TMS but which have long been missing in Lean. Critique of Lean explores the many factors that account for the large gap between expected and actual outcomes. In doing this, it exposes the myth that Lean = TPS and Lean = TMS. This volume utilizes the method of scholarly criticism to illuminate weaknesses in the Lean construct and identify pathways for improving Lean. It gives both the originators of Lean and its practitioners two improvement options: Improve Lean quickly to reduce the gap between TPS/TMS, or abandon Lean and pursue TPS/TMS – both with the intention to achieve better outcomes for all stakeholders. It is time to stop pretending that Lean is the same as TPS and The Toyota Way. And it is time to move beyond the hype and mindless cheerleading. Learn what is wrong with Lean and improve it. Critique of Lean will show you the way. 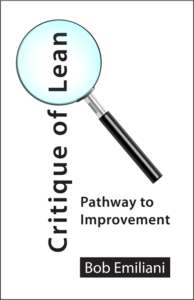 I spent a large part of my improvement journey thinking lean and kaizen were synonymous. When I started to question that, for a while I also questioned my sanity. It was only by experiencing kaizen that I started to see the difference. Hi Rachelle – Yes, Toyota’s industrial engineering-based kaizen method reveals the gaps like nothing else can. The big question is why TPS-style kaizen was left out of Lean. It was a huge mistake. Lean ≠ TPS. It’s not even close. I fully understand where you are coming from on this topic. I have had a similar experience. I first became enmeshed in “JIT” in the late 80’s while a Divisional VP of a large corporation. I learned it by interacting with other professionals, in other companies in the north east U.S., who were also undergoing a similar learning experience. (Fortunately, there were not a lot of “JIT/TPS” academics and consultants around at that time). While we had to go through an uncomfortable period of changing the way we think, in the long run it worked beautifully. I introduced it to several other companies during my career and all of these transformations were also very successful. It works! But then —- the academics/consultants started showing up. I was finally forced to start calling JIT “Lean” and the term “JIT” evolved into some kind of inventory management phenomena. “Respect for People” started to fade as more and more “Tools” started showing up. But I kept doing what I had learned way back then, and it continued to work. I retired about 10 years ago. But I kept watching from the sidelines. As I read the various forums and blogs, I began to realize that “Lean” had become a “flavor of the month club”. “Lean” had become indecipherable. There are still a few bright spots out there, but they are becoming harder to find. I look forward to reading your book and compare notes. I have also been writing about “real” Lean in my spare time, just so I don’t lose those valuable things I learned over the years. Hi Bill – Thank you so much for sharing your story. It is most interesting and parallels what I have heard from another person who carefully studied JIT around the time you did, and thus understood it far more deeply than an inventory reduction scheme. Academics are often too sure of what they know. Shingijutsu disabused me of that notion 5 years before I became an academic. It is clear that other academics were not as lucky as I was.